#DFISummit Schools’ Financial Inclusion Challenge. It is with great pleasure that we invite you to participate in the 2018 Schools' Financial Inclusion Challenge. The Digital and Financial Inclusion Summit #DFISummit under the theme #IncludeEveryOne invites school going children over the age of ten to participate in the Schools' Financial Inclusion Challenge. To participate in the challenge, write an article or poem about any of the below topics in not more than 1000 words and share it on the project website (http://www.digital-impact-awards.com/) or email address schools@digital-impact-awards.com. What should be done better to improve opening and operating savings accounts for minors? What should be done to deliver internet banking products for minors? How can mobile money be extended for minors? How can agency banking be extended for minors? What financial education approaches deliver best result for minors? How do digital financial services enable children empowerment? The challenge submission starts on 1st June 2018 and ends on 30th July 2018. The best entries will be reviewed by a panel of teachers and financial inclusion experts. The top 5 entries stand a chance to win the following prizes. A fully paid exposure trip to Silicon Valley and San Francisco, California. CONGRATULATIONS ON BECOMING A NATIONAL FINALIST! This is an amazing achievement so now is the time to tell everyone about it! The 2018 #Schools’ Financial Inclusion Challenge was a super successful experience, bringing to face amazing views of how minors around the nation wish to be served financially! 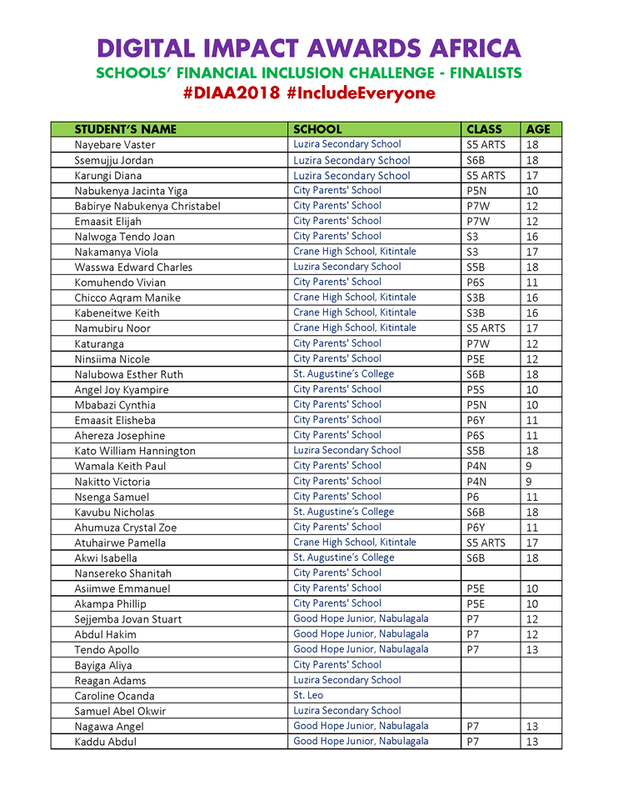 Below is a full list of the power students that made it to the National shortlist. See you all this Friday at Kampala Serena Hotel, Victoria Hall.